Here are 7 marketing ideas for optometrists and eye care centers that will help get you more patients and sell more eyeglasses, contacts, and Lasik procedures. Eye care is a booming business, which is both good and bad for local optometrists and eye care centers. It’s good in that people know more about eye health and corrective vision, so they seek services more than ever. It’s bad in that online eCommerce sites and large chains are pricing experienced optometrists and their optical services out of business. Marketing and patient retention are a battle today – but a battle you can still win. The value of a full-service, experienced eye care and optical center draws in plenty of people who don’t want to put their vision into the hands of a discount store. Here are some tips to help you target this audience, create a message that resonates with them, and turn them into loyal clientele. Step one in your optometry marketing efforts to design a top-notch website. In 2019, there is no excuse for having an outdated website. Consider that your website is your practice’s introduction, first impression, maps listing, contact info, appointment setter, and educational resource – all wrapped into one piece of collateral. It’s the focal point of search marketing, social media ads, and inquiries on your brand name. Designs like this are no longer expensive or time-consuming to develop. If your website is looking dated or is not mobile friendly, get it updated. 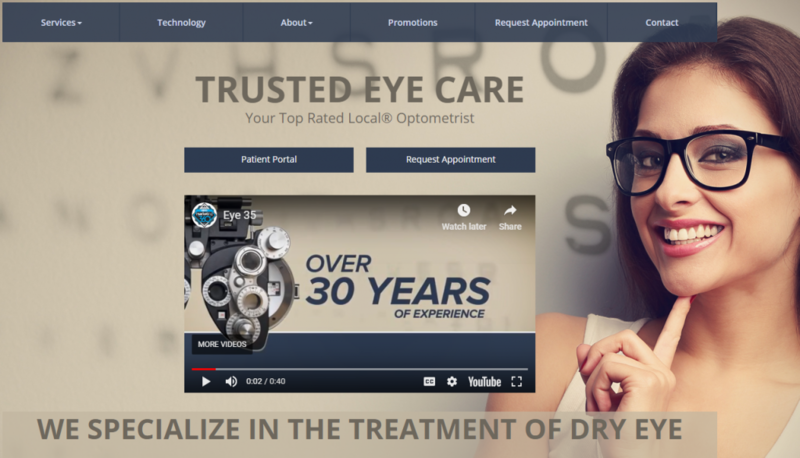 Read a case study on optometry website designs that convert. So Lenscrafter moved into town and you’re worried. Everybody’s going to choose the cheap chain, right? Ask yourself this: Do you give them a clear reason to choose you instead? Communicates a specific value you offer and/or specialize in. Clearly states how you solve your client’s problem or provide them with a needed benefit. States or implies why you are a better choice than your competition. What do you do that’s particularly useful for your patients? What do you offer that other eye care businesses don’t? Why should someone choose you instead of just saving money online? If you don’t answer those questions with your marketing material, then they won’t get answered at all. Don’t expect prospective clients to figure it out for themselves. The vast majority of eye care businesses fail to communicate a clear value proposition. When you search locally, optometry appears to be a commodity – everyone is the same. In fact, your services are no doubt similar to other optometrists. It’s not easy to identify and communicate a unique value proposition, which is why it’s so valuable for your marketing strategy. Delve into your services and make lists of things you do particularly well. Take stock of your products and note where you have something special. And most importantly, talk to your patients to discover what parts of your service they appreciate the most. Then test different headlines, copy, and calls to action to see what gives you the best results. Make real efforts to set yourself apart here and you’ll gain a strong competitive advantage. Today people don’t thumb through the yellow pages. They go on Google and search for services they need. Search traffic on Google (and Bing) are usually motivated by strong buying intent. People search for optometrists or optical services when they’re ready to come in and spend money. This is a channel you need to master in your area. There are three places to focus on. The first is pay-per-click (PPC) advertising. Here you bid on an auction system to rank ads for your target keywords. This is the fastest way to get on page one, and the only way to be in the top spots on page one. You have the most control over your ad copy and website landing page with PPC. The second place is the Google My Business, aka maps section. You set this up through the Google My Business platform. This is the main way Google knows where you do business, so they can list you when people do searches in your area. You can add photos, website links, and get reviews on this platform. Clicks from here are free. Third is your organic SEO placement. This is also free clicks and appears below the places listings. You rank here by optimizing your website for keywords, gaining links, social media traffic, and having quality user metrics. If you can rank high in all three places, you have that much greater chance of winning traffic. If there is one thing that rivals your value proposition in importance, it’s your online reputation. Today, consumers look to online reviews as an important way to evaluate services. There is an inherent trust level in the words of fellow consumers, and an insight that can only be gained from their perspective. Of course, those words are not always wise – or even fair. Which is why you need to manage your reputation as much as possible. It starts with your service. Superb customer service needs to be a mandate at your office. Know that every time you cut corners or fail to meet expectations, it can have lasting repercussions on your marketing. Same thing for when you delight people and exceed expectations. The best way to improve your review profile is to ask happy clients to leave you a review – a simple but often overlooked step. Do this in person right at the moment a client is delighted with their improved vision. You can also use a follow-up email with a link to the review profile you want to build. Monitor and respond to reviews on Top Rated Local, Google My Business, BBB, and Yelp. If you get a negative review, respond and rectify the situation. If you’re getting a lot of positive reviews, turn on the review feature on Facebook. Today, many of us lead our digital lives on social media. With so much of the consumer public engaged on social media, you know marketing and advertising won’t be far behind. You can use Facebook, Twitter, Instagram and Pinterest today to create brand awareness, share visual content, and even do direct-response advertising. Encourage your clients to share these posts across their networks. It’s free, creates brand awareness, and displays your products. There are also a lot of advertising opportunities on social that allow you to target audiences with precision. You can target ads to people who have previously bought glasses or contacts. Target by location, gender, income, interests, or profession. Social media has gone from an advertising blow-off to the most robust channels available. If there is any issue, it’s that the platforms are too big; it seems like Facebook comes out with new tactic every week. If you want to advertise extensively on social, consider hiring a social media management team. The power of video can’t be denied with digital marketing, yet it’s ignored by most optometry businesses. Video can be used on social media, embedded on your website, and keyword optimized on Youtube. Most videos have a shelf life of years, so the investment is worth it. If you think all this marketing sounds like a lot to deal with while running an optometry practice, you’re right. Digital marketing today is a multi-faceted discipline with interconnected tactics. It’s a far cry from the days of the yellow pages and maybe a newspaper ad. The truth is that few business owners today have the time or expertise to effectively manage multi-channel digital marketing campaigns. To really be effective, you need to test your content for conversion metrics, dial in your value proposition and evolve your strategy as new tactics are introduced. The good news is getting marketing help from Marketing 360® doesn’t have to be expensive. We’ll get you going with a free website design and reign in all these tactics so you have a cohesive strategy. Talk to one of your optometrist marketing consultants today. You can’t ignore digital marketing in 2017 any more than you can ignore uncorrected 20/100 vision.